Regal Wins casino offers mobile slots, casino games and a decent welcome bonus! Claim £500 Deposit Bonus Today! Have you always wanted to feel regal while playing at a mobile casino? Well, Regal Wins well certainly make you feel that way even if the website doesn't exactly look regal. But it's not always about looks and, as far as mobile casinos go, Regal Wins doesn't look half bad. With hundreds of slots to play and enough bonuses to fill Buckingham Palace, it's certainly worth your time and money to check out this casino at the very least. At MobileSlots4U, we do like a casino that knows what it is. Regal Wins knows what it is pretty well and provides players with all the content they need. Not only do you have a great selection of games available, but you feel valued as a player seeing as most of the promotions they provide put you right at home. It has a perfect blend of fantastic opportunities for the player to have a unique experience. 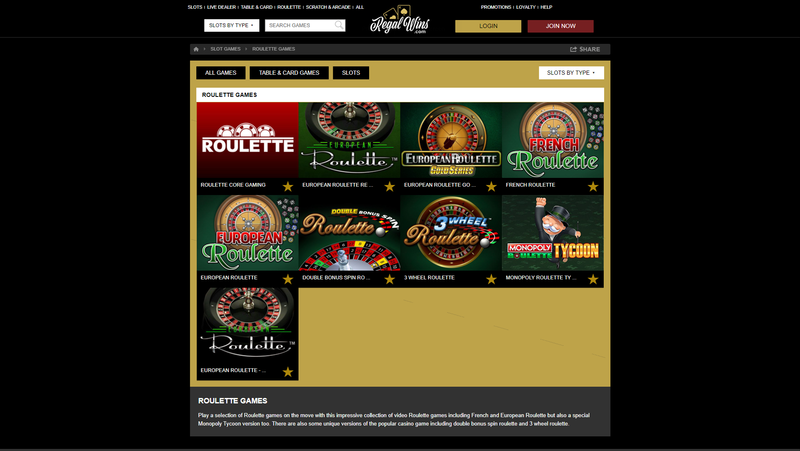 Slots from many different genres populate this site and it's all the better for it, fulfilling that need for variety. Regal Wins possess many types of games, too, so you will never get bored. Though, you might find it hard to choose where to start first! It's pretty evident that Regal Wins knows how to treat its players well because the amount of games they have is pretty impressive. Not only that but the sheer variety of games alone makes for some compelling gaming. There's certainly over 200 of them and they range from roulette, to slots, to table games, to scratch cards. Most of the content you can find here are from NetEnt, Eyecon, Scientific Games and that is just to name a few. In the slots department, you have 3 reel and 5 reel classic video slots plus a fair few mega progressive jackpots. You also have a variety of themes, including Mystical and Magic, Action Packed, Animal Lovers, Egyptian and Sports. Of course, what casino would be complete without some table games! You have your blackjack, poker and roulette but you also have a few extras like Beat Me and Super Wheel. Like we said, we don't think boredom will ever be an issue with Regal Wins thanks to this. The first thing you'll notice about Regal Wins is that they offer a £500 deposit bonus across the first three deposit any player makes after signing up. On the first, you get up 100% on £200. For the second, you get 40% on £200. And with the third, you get 50% of up to £100. Not a bad way to start off your experience. But with these promotions, you could also win extra spins with various slot titles such as Warlord and Wild Wild Est, both of which are fun to play and definitely worth a go on. Extra spins to use them isn't a bad deal, considering they could help you win a lot of money. Aside from those, you could win a share of £20,000 with NetEnt's Koi Princess roulette. Enter the prize draw today for a chance to put £1,000 in the bank! Hurry, though, as this promotion will last only until the end of July. But we're sure Regal Wins will have more where that came from. As for long-term promotions, you can take part in Regal Win's treasure hunt to uncover some fantastic prizes. All you have to do is pick a route on the map given to you (there are three in all) and follow it along to collect up to £100 in withdraw-able cash. There's also a Loyalty Programme and VIP for Regal Wins players who want an extra level of tailored promotional deals. This part is going to be fairly short as Regal Wins has a only a few selected forms of payment which you can use to deposit and withdraw with. Depositing at Regal Wins can be done in a number of ways. The first is through credit/debit card (VISA, Maestro, Mastecard). The second is through e-wallets such as Neteller and PayPal, while the third method (and this is the one we recommend) through pay by phone billing through Paysafecard. The minimum and maximum deposit requirements vary depending which method you choose to use. The average, however, is £10 minimum. As for the withdrawals, it's much more straightforward. You are allowed up to 10 withdrawals a day and they usually take between three and five business days on card or can happen immediately with other methods. Support at Regal Wins is a simple matter. You get to choose to contact them directly either through a Live Chat function or by phone on 0800 031 4961 (toll free) or via email at [email protected] They usually reply fairly quickly, but we ask you to be patient if they have not responded right away. They will endeavor to do so as soon as they can. Want to play at Regal Wins? Regal Wins has a decent amount of games, promotions and jackpots! 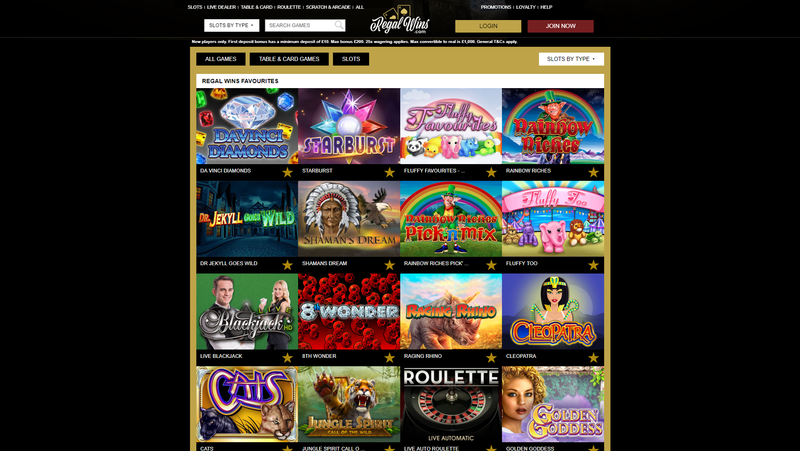 Regal Wins In conclusion, Regal Wins is a casino that has a lot going for it -- great games with a lot of variety, nice bonuses and long-term promotion schemes as well as a solid loyalty programme that gives players just what they want. The only criticism we could find is that the site doesn't look much different from many other sites. It doesn't look bad but it does look a tad generic. It's content is certainly not generic, however, so we wish its design reflected this. Overall, however, we think they've got it covered. A solid approval from us. PreviousWhich Is Better: Real Life Gambling Or Mobile Gambling? PokerStars Mobile Casino Review — Harmonious Table Games And Slots!